Among the Gurus who taught me and greatly influenced me is an almost unknown deeply spiritual Sadhu by the name of Brahmchari Shiv Chaitanya. He was an open, giving person who devoted all his time to the pursuit of god realization and he was gracious to impart us (his disciples and devotees) his wisdom and numerous spiritual practices. Most people will never be able to meet such a sadhu, in great part, because they do not seek such a person, but also because very few such personages exist in the world at any given time. I share with all of you about my experiences with him and draw a brief sketch of his life that I hope will inspire people to seek the permanent source of love, bliss, freedom, knowledge, wisdom, compassion and all other noble and higher qualities. During the times that I spent in special Sadhana, I spent a large part of that time on the banks of the River Narmada. There is a saying in India about the benefits of being on the banks of the three main rivers which goes like this: “Knowledge on the banks of the Ganga, Bhakti on the banks of the Yamuna and Tapasya on the banks of the Narmada”. The entire banks of the Narmada river (both sides) have a combined length of about 3500 kms. The Narmada is the only river in India where a complete Parikrama (spiritual journey or pilgrimage by walking on the banks of the river usually done barefoot by walking around the entire river, thereby encircling it) is performed. This Parikrama brings enormous spiritual benefit and when one walks around the river, the river should be on the right hand of the person walking, so this is also called Pradakshina. This Pradakshina is done with a very strict set of rules. One cannot cross the river at any time during this period, only at the end of the river where it meets the sea, does one take a boat to cross over, and neither can one turn back at any point. The Parikrama has special spiritual importance due to numerous reasons. All around the Narmada on both sides are many temples that are Siddh Peeths and Dhams. (the word Siddh means perfected or it can also be understood as completely conscious, Peeth means a Temple devoted to the divine mother, whereas Dham means a temple devoted to a Masculine form of God). On both sides of the banks of the river, live many sannyasis and spiritual persons of a very high caliber. It is also said that so many Siddhs (perfected spiritual practitioners) (especially meaning or signifying those at the subtle level) live on the both sides of the Narmada that they almost touch each other. In the scriptures the period prescribed for the Parikrama is 3 years, 3 months and 13 days. If you want to become an ascetic, a tapasvi then it is the Narmada river where one should perform spiritual practices. At one point in time, I had completed a special practice and was taking a small break from serious practice. With some time available I decided to utilize this to visit other sannyasis (monks) in the Narmada Kshetra (area). During this period, one of my Sannyasi acquaintances who was an Udaseen Sannyasi of French origin by the name of Sumeru Muni and I, decided to travel together. He had been in this area for over 20 years and had travelled extensively on the banks of the Narmada, he knew a lot of special spiritual places as well as some good Sadhaks (spiritual practitioners). Naturally, I was interested in knowing all about these places and Sadhaks. Together we travelled along the banks of the Narmada visiting these Sadhaks and places. We would talk about various sadhus on the banks of the Narmada, would discuss philosophy, spiritual practices, meet people, wander into the forests and on the banks of the Narmada river. During one such conversation he mentioned Brahmchari Shiv Chaitanya telling me in detail about his ashram as well as he mentioned a particular depiction of an unusual form of god that he had seen in Brahmchariji’s ashram. The description immediately caught my attention as I perceived it to be the particular form of Lord Shiv that is unusual and rare. It is also a special practice that I had been keen to learn. On my further questioning him, he did not seem to know much more about it. That day I knew that I had to visit Brahmchariji. It is very interesting how many things happen in life. Even before I had heard of Brahmchariji, I had planned to travel to many places in Madhya Pradesh. About 125 kms away from Omkareshwar which is a Jyotirling, is another small town called Maheshwar located on the banks of the river Narmada. Every time I would see it on the Map, I would say to other sannyasis, I need to visit that place, who would answer me saying that there is nothing there except for an old fort, but to me this place had an intense magnetism. It was in this small, but ancient, very holy town of Maheshwar that Brahmchari Shiv Chaitanyaji lived. Actually, the city is a part of a special area (Siddh Kshetra) including Omkareshwar, Ujjain, Mandaleshwar, Indore, Barhwah, etc. But Maheshwar has its own uniqueness. This city is the city of the Great Queen Ahilya Bai Holkar, (31st, May, 1725 – 13th, August, 1795) (ruled 11th, December, 1767 – 13th, August, 1795), one of the very well known queens of the Royal Maratha Holkar family. She ruled Nimar, Malwa and additionally other regions. Her reign was an ideal one and she took care of her people. The people loved her; she was very pious, with excellent administrative abilities and an able ruler. People were prosperous in her reign. She was a great devotee of Lord Shiv and ruled in his name. Each letter that she issued was issued on behalf of Lord Shiv who she considered the true King of her country, considering herself merely as the caretaker of the Kingdom. Queen Ahilya Bai is very well known for her contribution to the construction of numerous civil works for spiritual and religious use as well as for renovating the Vishwanath Jyotirling temple in Varanasi (Benares) and the Somnath Jyotirling temple in Gujrat. So highly was the queen revered that even today people take her name with respect and love, especially in Maheshwar, people will address her as MaaSa Ahilya Devi meaning respected mother (also translated as ‘Mausi’ meaning mother’s sister) Ahilya Devi. In Maheshwar the fort of Queen Ahilya Bai stands to this day. Within it is the ancient temple of Sahasrabahu Arjun who is believed to be an incarnation of the Sudershan Chakra. Brahmchariji was born in the village of Jamalpur in Nizamabad Tehsil in the District of Azamgarh in Bihar in a Brahmin Family approximately in the year 1912. His father was a Gayatri Upasak (practitioner) and his elder brother was a Siddh (perfected) Baglamukhi upasak and was many years senior to him. In his childhood Brahmchariji lost both his parents and was brought up by his Brother and his wife (Bhabhi) whom he regarded as a mother. When he was twelve, Brahmchariji went to Varanasi to learn Sanskrit. A little later, for various reasons he shifted to Aurangabad to study at the BarjaMatth. After studying for some time Brahmcharji was initiated into the order by the Mahant of BarjaMatth. The Swami was also the head of the matth (Ashram) in Chappra called Bakulhar Matth. Both these Ashrams (Monasteries) were very rich and had properties worth millions. After a few years the Swami of the Matth was very pleased with the sewa bhav (attitude to serve), other attitudes, learning and qualities of Brahmchariji. Swamiji then proposed to make Brahmchariji his successor since he was the senior most as well. On hearing this proposal Brahmchariji replied “Please give me your blessings. If I had wanted to enjoy the riches of this world I would have stayed back at home, married and lead a family life. Please make my younger Guru bhai (brother) Ramanandji as the successor. I have not taken birth to enjoy the goodies of this world. I took birth so that I could lead a life of contemplation, meditation and prayer.” When Swamiji heard this he was so touched that tears started flowing down his cheeks. Some time later, at the age of 19, Brahmchariji was inspired to be in Maheshwar, where he met a Brahmin person who was called Mahatma Joshi and for some time he stayed with him. Both Brahmchariji and Mahatma Joshi decided to perform one Parikrama of the Narmada however due to certain reasons they were forced to finish the Parikrama in lesser time. It is said that the merit of the Narmada Parikrama is equal to one Purascharna (special practice) of the Gayatri Mantra or one darshan (meeting(here in the sense of seeing)) of Ashwatthama. After completing the Parikrama Brahmchariji stayed in many different places in Maheshwar. On the banks of the Narmada not far from the fort, stand two Chatris or small temple monuments, one of which is a temple while the other is a memorial tomb belonging to members of Queen Ahilya Bai’s family namely her daughter Muktabai and her husband Phandse. Brahmchariji would sometimes recall how he had spent a very difficult and tough fifteen years living, sleeping and praying on the small verandah (which is more like an open passage encircling the temple with a roof but open on the sides) of the temple. Here some will wonder why a person should reject a comfortable life for a life of hardship and poverty. Most people fail to understand that the life of prayer, of a sannyasi (a Hindu monk) is not one of living without possessions because one is poor and cannot earn wealth. But to the contrary, it is a choice made by rejecting the pleasures of this world to perfect something much higher and better than a comfortable life. Traditionally, often kings would give up their Kingdoms to live a life of sacrifice. It is about attaining a high level of consciousness and self realization. On the sides of the Chatris, beside the gate to the ghats, are two large halls with two attached rooms. Later, one such hall was occupied by Brahmchariji where Brahmchariji spent most of his life, while the other was occupied by another Sannyasi who the people called Madrasi Baba. Here within the premises, one of the larger rooms was converted by Brahmchariji into a small private temple where he established the statue(Murti) of the Divine Mother Gayatri (Savitri Devi). Due the strength of the tapasya of Brahmchariji the place has today become a Siddh Peeth of Ma Gayatri Devi, however it is still maintained privately and not many people know of it. (Tapasya means asceticism. In India, the sun is very strong, so the word Tap is often used in the context of the earth heating up, or the weather being unusually warm or hot. Tap or Tapna literally means getting heated up, baked or cooked. Hence Tapasya means strengthening the body, mind and spirit by intense practices that toughen the individual. Tapasya can also be understood as withstanding intense hardships to achieve a certain goal such as an intense spiritual practice). (Jap or Japah is the repetition of a mantra usually done on a rosary called a Mala). His Ideal: Brahmchariji had been inspired by the ideals of Samarth Guru Ramdas who had said that a person has the right to become a Sannyasi only if he has done at least 14 crore (140 million) repetitions of the Gayatri or any other similar mantra. Brahmchariji was very inspired by the life and Tapasya of Swami Ramdas and looked upon him as his ideal. It is well known that Samarth Guru Ramdas was a very able guru (Samarth means able). He was known for his tapas and it is said that he would often stand in chest deep water for hours and perform jap. While he was at it, the fishes would bite him and eat some flesh so he had numerous marks of fish bites on his body. Interestingly enough, in India, the tradition says that a Guru becomes famous or is known due to his disciples. Guru Ramdas became well known due to his disciple, the King Chatrapati Shivaji who was known for his guerilla warfare tactics. King Shivaji was a very well known historical figure who had offered his entire kingdom to his Guru—Samarth Guru Ramdasji, who in turn had asked King Shivaji to rule in the Guru’s name. Though Brahmchariji never mentioned it, but we knew of this from his other companions and long standing disciples, as well as from his students who served him. When he was younger, he too would stand in the water till his chest and he too had numerous fish bite marks on his body especially on his legs. By end of his lifetime, Brahmchariji had completed his jap target of 14 crores (140 million) repetitions of the turiya Gayatri Mantra along with numerous other practices. That number of repetitions is an almost impossible number especially since the mantra is quite long, one that we (his students) will find very difficult to complete, in fact, even to do probably half the number. Working with the Mantra: One time I was asking him about a particular mantra practice and said “Baba this particular mantra is so long, if a sadhak had to even be able to do 50 malas (rosary, where one mala has 108 beads but generally we count one mala as 100, therefore each mala means 100 repetitions of the mantra) which is a very tall order as this mantra is long and to do one mala it takes about 10-12 minutes at least. So to do 50 malas, the person needs about 500 to 600 minutes which is 8 ½ to 10 hours practice every day and he needs to complete about 20.4 million (2.04 crore) repetitions. He would take approximately 12 years to complete this practice”. Brahmchariji looked at me and very calmly said “Very easily, that is, if one manages to stick to the daily target as well as to absorb the spiritual energy generated by the practice of the mantra”. I give this particular example so as to allow the reader to have an insight into the process of mantrayog as well as to understand what completing a practice of 140 million repetitions of the Turiya Gayatri means. One mala of Turiya Gayatri which is longer than the regular Gayatri mantra would take an average person about 15-20 minutes, whereas a very good practitioner about eight minutes and maybe, it may get reduced to about five-six minutes for an outstandingly excellent practitioner. So success, in mantrayog needs dedication and constant effort. Privately, quite rarely, he would tell us, some of his very close disciples; that the divine mother in the form of Gayatri (Savitri) appears before me and asks me what I want. He was god realized. His speed and practice of doing mantras and texts was so good that he seemed to be doing a full mala of the turiya Gayatri in less than a minute. We noted this when he would do the havan (fire ceremony with mantra). The Kakaradi Kali Sahasranam stotra (A text devoted to Kali having one thousand names of Kali and each name/mantra begins with the letter ‘K’) usually takes about 15 minutes to repeat once, a good sadhak can reduce to 10 minutes and perhaps such a good Sadhak may be able to do two-three repetitions in a day as it invokes an enormous amount of spiritual energy; it has a very sharp and aggressive energy to it. Brahmchariji would repeat this text a hundred and eight times each day. He kept doing this for a long time, finally he says the divine mother appeared and blessed him. He continued to do this practice and she appeared repeatedly before him, at one point in time, he says the divine mother appeared and said that she had already blessed and graced him, that now he must stop doing this practice. Only then did he stop. Such was his level and intensity of spiritual practice. His spiritual practice of Jap was incessant. Any spiritual practice needs commitment, dedication, serious effort, one-pointedness, patience, regularity, and from amongst many other things, grace of the Guru. Apart from the Gayatri, Brahmchariji had done numerous other spiritual practices, mantras, texts, Kavaches (Armors), and all this with a very large number of repetitions. He enjoyed reading scriptures and had also corrected and commented on many texts publishing almost 30 texts and practices. He would write some poetry too. Till almost the last 5-6 years of his life, Brahmchariji would cook his own food as well and had advised me to do the same. His daily routine was very unusual. He would have a bath at about 03:00 hrs, then he would do Jap. At about 04:30 hrs, he would do Havan (Vedic fire ceremony) for about an hour, after which he would again do Jap. From 07:00 hrs to 09:00 hrs people could meet him. After 09:00 hrs he would have some food and about 9:30-10:00 hrs he would take rest/ sleep for about two hrs till about 12:00 hrs. Then again he would do Jap till about 15:00 hrs. From 15:00 hrs to 17:00 hrs people could meet him. At about 18:00 hrs he would have a meal and then rest up till 20:00 hrs. Then up to 03:00 hrs he would sit for Jap, that is the entire night. He would do Jap for almost 9-10 hrs a day, a routine that he followed for all of his life. If somebody came to visit him during any other time, he would politely ask them to come back during visiting hours saying I have to do Jap. And even during the time when people were allowed to visit him, if there were no visitors he would be doing Jap. Very few people were allowed to visit him regularly, if somebody wanted to do that, he would say I have to do Jap, please do not come every day. Though visiting hours were two hours in the morning and evening but usually few people were allowed to remain with him for longer than half an hour. They could be in the ashram, but after half an hour, he would ask them to have Prasad and get back to his Jap. One panditji called Vinayak Shastri served him for almost about 30 years. He would say that Brahmchariji was so fond of punctuality that if he came five minutes late, he would be questioned and reprimanded for being late. That was the kind of strict and dedicated routine that gave Brahmchariji perfection. Brahmchariji would often joke that he was addicted to Jap and reading of scriptures. As a personality, Brahmchariji kept away from the world, he did not like being disturbed by worldly matters and dedicated his life to tapasya, to asceticism, devoting many hours every day in continuous prayer. He could easily sit for 6-8 hours in one pose and do his Jap. He had this enormous humility about him and treated everyone with love and respect. He would willingly give mantras and spiritual practices to most of those who asked for them. He had an enormous spiritual power that he never displayed; always telling us that by talking about it or showing off one can lose this divine power. 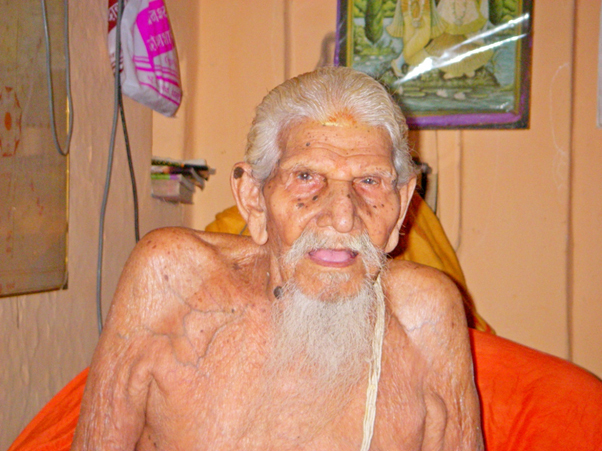 Brahmchariji would tell us that when he was about 60 years old, he had a dream. In that dream a sannyasi appeared and said “Go to the home of this particular Brahmin in the Village of Devariya. There you will find some hand written manuscripts. Take them.” Brahmchariji says he ignored the dream. But the same Sannyasi appeared the next day and the following day and the day after giving the same instructions. Brahmchariji continued to ignore the dream. Then he appeared again in a dream on the fifth-sixth day and scolded him saying “Why don’t you go and collect these manuscripts. Go immediately and collect them.” Brahmchari says he immediately woke up, joined his hands in a pranam and said “Please forgive me, I will definitely go today.” The very same day he went to visit this particular Brahmin in Devariya, a village not very far from Maheshwar and from there obtained these handwritten manuscripts. Brahmchariji says “When I opened them, they turned out to be a treasure of rare & very valuable mantras and texts especially of the Gayatri upasana.” These texts were kept securely by Brahmchariji. Some of them were printed and many of us aspirants were initiated into these practices. One time one of his regular devotees and frequent visitors by the name of Mangelal Mahajan came to visit him with one of his grandsons. The child was small and was playing in the ashram. Usually, Brahmchariji would never make any comment but on that day he repeatedly told Mangelal to look after his grandson, saying that pay attention to him, he is being mischievous, but Mangelal did not pay much attention saying that he is a child, let him play. After some time the child fell off the balcony onto the ghat on a stone platform from a height of about 10-12 meters (about 33-40 feet). All the persons present were shocked and ran out to see the child, but the child was unharmed, almost without a scratch. An onlooker who saw him fall commented “I saw the child fall, it is very strange but he seemed to be falling in slow motion”. When they came back with the child, Brahmchariji merely asked how the child was and then nodded his head saying ‘grace of the divine mother that he was saved’ and continued with his jap. To mention another miraculous case, a devotee despite good qualifications had not been able to get a job for almost a year and a half. Being quite depressed and in desperation he came to Baba. Baba said “Stay here for a few days and perhaps the Divine Mother Narmada and Gayatri will bless you as you are in a spiritual place”. In about 8-9 days he got a call from a good company for a job. When he told Brahmchariji, all baba said was that the divine mother is very kind. The man went to his job happily. But Brahmchariji would pretend to not know anything and would ascribe the miracle to the divine mother. He was so humble. There were numerous such incidents. Certain parts of the Banks of the Narmada River are particularly active with ‘beings’ from other planes. Usually, among them are saints in ‘subtle form’, but there are numerous other beings as well. Some of the Sadhus of the past who were engaged in Sadhana had become perfected in many ways and many have overcome death. Since such spiritual masters had attained to Yogic perfection, they are almost deathless and they have attained all the eight siddhis. (The eight Siddhis are Anima, Mahima, Laghima, Garima, Prapthi, Prakashym , Isithavam, & Vasithavam). The correct word used to describe such masters is ‘Chiranjeevi’ meaning ‘the long lived ones’. According to Hindu belief there are seven Chiranjeevis who are always on the earth. It is said that in the next Kalp (cycle of creation according to Sanatan Dharma) these seven Chiranjeevis will be the seven Rishis (SaptRishis) who protect Dharma on earth. They are King Bali, Lord Parshuram, Lord Hanuman, King Vibhishan, MahaRishi Vyas, Acharya Kripa (Kripacharya) and Prince Ashwatthama. Usually an additional eighth one is also counted—MahaRishi Markandeya. Apart from these Chiranjeevis there are numerous other saints who are ‘Chiranjeevi’ as people have had unusual experiences in various parts of India with such saints. Usually, one will observe that certain spots along the Narmada and in other parts of India will attract some high level Sadhaks to settle down there. Often, the case is that there may be some ancient Rishi, Nath Sadhu or other Sadhak of times gone by who may visit or be in such a place invisible to the naked eye. People, however, usually like these places, they feel some energy and therefore often visit them without really being able to consciously understand the reason for it. The banks of the Narmada River at Maheshwar are one such place which is full of subtle beings especially saints in subtle form. At one time some of us Sannyasis (Hindu monks) were discussing various topics and the discussion went to the ghats (cemented banks of the Narmada River used for bathing). The Narmada River is particularly broad at Maheshwar, perhaps almost a kilometer. I pointed out that most of these ghats were special and especially one of the ghats where we would bathe everyday was a very special one and that something seemed to happen there every day. Another visiting sadhu by the name of Swami KarunanidhanDas became very interested and insisted that I explain myself, to which all I said was that something special happens each night. He decided to sleep at the Ghat for the night to himself experience what was special about this Ghat. This particular Ghat had a higher energy level that was perceptible to many people, in fact certain men who lived in the town would come to bathe there each morning despite having all comforts in their homes. Such was the attraction of people to this ghat. So Swami KarunanidhanDas carried a mattress to the ghat, setting up his bed there, in the open, by the river, in between two ghats and decided to experience what could happen. The next day I questioned him on his experience. At first he would not say much and tried to avoid the question, but now it was my turn to be insistent. Ultimately, he gave in and told me that he did not really think much would happen, so he tried to fall asleep, but he could not really sleep as there was a very high energy at the banks, so he lay there in a state between sleep and awake. At about 2:30-3:00 a.m. he could see a saint who did not look very old but neither was he young, dressed in white surrounded by some light walking at a good pace by the banks of the river. Swami KarunanidhanDas was actually sleeping between two ghats, as the ghats had an extension protruding into the river between each other that divided them, somewhat like an elongated platform and had a Shiv ling as well as some space. So he could easily see the Saint walking right past him but when he tried to move, he could not move. He said “I could see him walking past, I realized that I was seeing a special saint, but I could not move. I saw him walking into the horizon helplessly”. There were a limited number of Sannyasis and saints in Maheshwar, mostly we all knew each other. This saint did not fit the description of anyone at all that we knew. But then, there was much more going on at this ghat. However, such incidents are not uncommon in India especially on the banks of the Narmada River. Brahmchariji would easily see these Sages and beings, some of whom were not visible to most people and communicate with them too. He would only talk about this to a few of us. One night, past midnight, while he was doing jap, along with him, there were two other students (shishyas) who were also doing their practices and serving him, one student had fallen asleep while the other was doing jap. Suddenly, he looks at this student (Brahmchari Govind Chaitanya) and says “Give him Dakshina (money offering given to saints and Brahmins)”. Brahmchari Govind Chaitanya says I looked around but I could not see anybody. Brahmchariji looks at him in irritation and again repeats “Give him dakshina”. Brahmchari Govind Chaitanya relates the story to us saying who could I have given Dakshina to? For I did not see anybody; all the hairs on my body were standing. So he looks at Brahmchariji in confusion and says “To whom Guruji, I do not see anybody”. Brahmchariji looks at him in irritation and says “You have been slow, he has gone away”. The next day on asking Brahmchariji, he says that it was a visiting saint. Brahmchari Govind who narrates the story to me says ‘My hair stand on their ends to this day when I remember the incident on that night’. Privately, Brahmchariji would tell us that wherever the sacred Gayatri mantra is practiced, many Saints and Rishis in subtle form will come to visit, so as we practice the Gayatri, they come here too. Some similar encounters with beings from subtle worlds happened with some of us as well. Actually, this section and the next section are sections that I did not want to write, to share these very private and personal experiences very publicly as I feel that it is revealing much more than I would like to, after all, individual practices and experiences are generally not shared for various reasons and then perhaps some of this may sound like self promotion or bragging, both of which I do not wish to do. However, after careful consideration I came to conclude that it would be inspirational to write these two sections for the benefit and motivation of all those people who want to understand the tradition, who strive to walk on the difficult spiritual path. In the Hindu tradition, Gurus will very often not say something directly or even always behave in a supportive manner, but instead can be quite rough and abrasive, often saying things somewhat indirectly. The ancient tradition has some strange ways that are not understood by the common man and sometimes even by some sadhaks. Sometimes, the Guru can be outright tough, harsh, even to the extent of cruel in his behavior with his disciple. This often happens when a Guru sees a disciple who he feels has the potential to be shaped into a good future Sadhak, has the possibility of being self realized and will become an inspiration to others as well to walk on the spiritual path, or in some cases the Guru may feel that he has the potential to become a future Guru. Then the Guru will start hammering his disciple much like a goldsmith crafting an ornament. Some Gurus especially of the old school will put their disciple to test and make things quite difficult for their disciple, often watching him to see if he has the instinct, the perseverance, the dedication, the ability to adapt, to face hardships, to overcome difficulties, the willpower to survive, all the while developing oneself spiritually. If he survives, he is fit to be taught, otherwise he just misses the possibility. It is in a certain specific sense, like the training imparted to military persons, only the fittest are assigned to specialized units. Much in the same way, on the spiritual path, only those persons with a one pointed mind reach their goal, the rest get left behind. Usually, many of the tough minded individuals were able to live this spiritual life especially the life of a sannyasi, of rejecting all the comforts of one’s home, to live in a forest as a Tapasvi. Bharat has a long tradition of Kings and queens, of other high personages leaving the comfort of their palaces and homes to seek perfection on the spiritual path. Though the outward behavior of the Guru is often tough & harsh, yet inwardly, the Guru is compassionate, soft hearted and will nurture a shishya like both the parents put together and much more. So many students, especially many Indians who are western educated & westerners are often demoralized by such behavior towards them. But while all this outward drama is taking place, the Guru is carefully observing in detail the reactions and the habits of the disciple. The Disciple has to learn to see beyond the outer behavior of the Guru, allowing him to work freely on them, to change and mould them into the shape he wants to. There has to be a great element of surrender and trust to the Guru without which the spiritual journey cannot really be made and the relationship will not work. On the other hand, a Good Guru will never ask his student to do immoral and adharmic things, so never allow yourself to fall into any such relationship where you have to do something that is not dharmic. However, one must learn to differentiate between Dharmic and Adharmic behavior. It is not unusual for the Guru to even kick out his Shishya but one has to keep going back. One particular Swami (a good Guru) of the Udaseen Sampradaya I met told me that his Guru went to the extent of calling the police to kick him out of the ashram, but he still went back. The reward of such dedication was that he was blessed by his Guru before he died. That blessing alone made him a master. As I already mentioned earlier, when Sumeru Muni talked about this picture of a strange form of god, I knew I wanted to go and visit Brahmchariji to know more about this form and also to confirm if it was indeed the practice that I wanted to learn. When I reached Brahmchariji and spoke to him, it turned out to be exactly what I wanted to learn. He showed me these mantras written in a hand written book that he had written himself as well as each page was laminated to preserve the mantras, but I wanted him to impart these to me. When I asked Brahmchariji for the special practice, his initial reaction was: “Why are you asking me?” So I folded my hands in front of him and told him: “Baba, I have come a long way especially for this practice, to get your blessings to practice them.” He thought about it for a few moments and he looked at me and then said “Okay, fine.” He opened the note book that was handwritten, and slowly dictated mantras from it to me. As a few days went by, he became very pleased with me and allowed me to photocopy the handwritten, laminated note book, which had many mantras and practices in it. The mantras that I had specially come to receive from him, were from a certain Shastra (scripture), which was an entire scripture by itself. So I felt that he must have this scripture and I asked him about it. He calmly denied and said, that “We don’t have it here.” Sometimes Hindu masters use the technique of avoidance and denial of a particular technique to avoid passing spiritual practices to somebody, as well as to avoid being pestered by people who want a certain practice. But I could intuitively feel that he had the entire scripture and practice. I was quite disappointed to hear him say that. In a few days, there was a special festival, on which the Brahmins change their sacred thread. So he invited me to also come to the festival along with some of his disciples who were there too. During the ceremony he made me wear a Janeau (sacred thread) with twelve strings, which is usually worn by Acharyas. I was very happy to be blessed by him in this way. At the end of the ceremony he was very pleased with me. In two days, his birthday was coming up, a special lunch was prepared and I too was invited to the lunch by Brahmchariji. During the lunch I felt that he was showering grace on all of us. The next day, as was my usual practice, I went to see him at the usual time. He was sitting with one disciple, who was his attendant too, and no one else was there. As I went and bowed in front of him, he angrily asked me: “Why do you visit every day?” I was taken aback and felt that maybe I should leave. But he kept talking to me. He went on, saying that: “I am old now, I get tired, after yesterday’s function don’t you realize I need rest? People keep coming to me, they keep disturbing me, they don’t understand my time is valuable, when will I do my jap?” I felt rather guilty and didn’t want to infringe on his time. I didn’t really know what to do, I didn’t want to disturb him, but since he was talking to me I could not go away. Then he turned to his assistant and asked him in a rather rough tone if we have so and so scripture. It was the practice I had come looking for. The assistant said “Yes Baba, we have it.” So he told him in a rather loud, almost angry sounding tone: “Bring it to me!” and he added “Get the copy!” The assistant ran and brought the copy to him, all the while he was looking at me with a look that appeared to be angry. But by now I knew something big was happening. I smelt it. So I calmly sat down before him, still being unsure what was going on. Then he very sharply said to the attendant: “You have the original too, bring the original!” He looked at the original and then gave it back to the attendant and told him to keep it safe; Baba looked quite irritated and angry. Then he opened the copy, looked at the pages and slammed it shut. Very roughly, with a lot of animosity, he looked at me and gave me the copy, saying: “This is for you!” I was quite stunned but I smiled, filled with joy and took the scripture from him. After a couple of minutes, his demeanor changed completely, he calmed down and became his usual self. A little later he added that I could do all the practices in this Shastr. After that he spoke to me for another ten-fifteen minutes about general things. Later I left, with the scripture safely tucked away, to my room. Around the same time he also initiated me into most of the practices related to the Gayatri Upasana (worship, prayer) which most of his other students too were practicing as well as numerous other practices too. In early 2008, in spring I had been in Tarkeshwar and had spent some time with Swami Hariharanand Bharti. He had been gracious enough as usual to shower me with his grace and love. In the end of June, 2008, he left his body while I was abroad. I was quite heartbroken to lose him. Losing Swami Hari also made me realize that I ought to spend as much time as I could, as well as learn as much as I could from my Gurus; these generous and fascinating sages while they were in physical form. That particular time had also being challenging as I was facing some unusual and tough problems. In my opinion reacting to many of these problems at the worldly level was quite foolish, instead I chose to concentrate much more strongly and deeply on prayer and spiritual practice. I also realized that though Brahmchariji had given me the special practice I had wanted, yet I had not been able to perform as much as I would have liked to, also I understood very well that on my own I was not going to be able to really optimize as well as absorb and manage the practice. So I decided to do something special. I was abroad and I called him from there asking permission to visit him on Guru Purnima. Permission was granted. When I came back to India, it was just before Guru Purnima so I straight away headed for Maheshwar to spend some time with Brahmchariji. When I met him, I said to him “Baba, please let me stay here and please guide and allow me to do this special practice at your feet”. He as usual was kind and gracious, he immediately agreed. I was allotted a special room about 15-20 metres away from his ashram where Brahmchariji had earlier lived and practiced. The room had had two very ancient temples on both sides, one is about 5000 years old and is the place where Maharishi Matang would pray and is called Matangeshwar Mahadev, while on the other side is a temple that was over a thousand years old, of Ma ManglaGauri. It is the entrance to a tunnel that leads to Ujjain and is said to be the tunnel of the great King Bharatriharinath. Currently, the tunnel has been closed down by cementing it as there were problems with water seepage and snakes that would come out of the tunnel. Brahmchariji had earlier already initiated me to this mantra which I had been practicing but I wanted to do an intense practice and increase the number of repetitions substantially. When I asked Baba for permission to do the practice, he looked at me and said “You know this Devta will not let you do the mantra so intensely unless you do the practice of so and so mantra (it belonged to the divine mother) along with this practice. Only the goddess can control this Devta and this mantra, so you do both the practices together”. This was a very tall order as both the mantras were very long. I was also doing some other mantras and texts that were a part of my daily practices and some special practices. So I knew this would be tough. I made a rough calculation and figured out that it would take me about 9-12hrs each day to finish all the practices. It was also going to be tough because the mantra had very high energies. So I looked and him and said “Baba, it will take about 9-12 hrs each day”. He nodded his head at me and gently said “Let it take as much time as it takes”. So there it was, my wish to do the practice became a reality, and I just had to and so strongly wanted to do this practice. I understood for myself that completing this practice meant doing maybe even much more than many other sadhaks could hope to achieve in their entire lives. There was of course no way I could have done it on my own. The mantra was Brahmcharijis, the grace was his, the Shakti(power) was his, the push was his; it was almost as though he was doing it. When I remember the practice, all I remember is a period of time when the world was still except for the mantra. I almost lost track of the days and the weeks, of day and night. I would be doing the mantra all the time, when I would get really tired, I would sleep for a couple of hours and when I woke up I would get back to practicing the mantra again, perhaps I slept a total of about 4-5 hours in a day (about 2 to 2-1/2 hrs, twice a day). Eventually, after a month my body refused to obey me anymore and demanded that I sleep properly at one stretch which I was forced to do for a couple of days and then got back to the old routine. The practice was meant to be finished in 41 days but there was no way that I could have done it in that time period, instead it lasted two and a half months. At the end of the practice, there was a sense of accomplishment, it was clear that my energy structure had changed forever and I got the feeling that due to the grace of Brahmchariji I had been able to complete a practice and pushed to a level that would have otherwise taken many years to achieve. For that I am eternally grateful to Guruji. In Hindu philosophy it is said that there are three debts that can never be repaid; the Debt to God, the Debt to the Guru and the Debt to one’s parents. Perhaps, the only way of sorts, to repay the debt to the Guru is to teach systematically and with much grace, another Disciple the knowledge that the Guru imparted to us. Keep doing your mantra and spiritual practices incessantly.